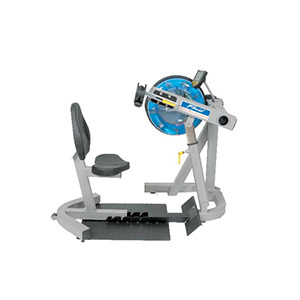 The First Degree E-920 Ergometer Upper Body Cycle gives users the option of adjusting the crank arm length. This feature is especially useful for mechanical / rehab use. The new, unique and technologically advanced E-920 UBE Fluid Cycle by First Degree Fitness is one of a family of superb exercise machines that has revolutionized the way people exercise all over the World. This First Degree Fluid Cycle is a fabulous exercise machine that effectively engages almost every muscles in the human body. The brief for our design engineers was to research all aspects of user interface with all machines in our range. Every potential improvement was identified and incorporated into the new Evolution Series. The results speak for themselves. 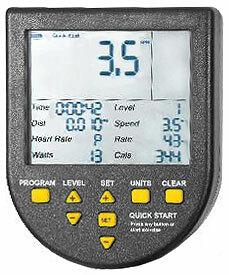 All commercial machines in the Evolution Series (except E-216 Rower) utilise the new Interactive Performance Monitor. The Interactive Performance Monitor (IPM) displays: time; speed; distance; revolutions per minute; calories per hour; watts; level and has a heart rate receiver built in. Incorporating a multi-function display that provides everything you need to monitor, motivate and progress, the IPM give you quick start, manual programs, interval training, 6 previous workout memories and a unique Pacer system guaranteed to challenge and inspire you. Changes can be made during an exercise program. 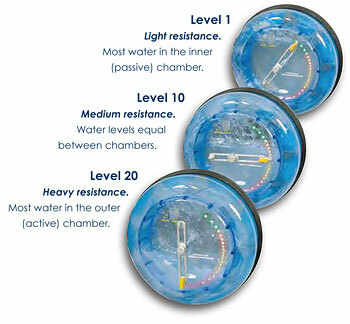 The resistance level can be set to provide precise results. A level gauge lets you know when to change the batteries. Bigger, better, smarter – the IPM gives you improved functionality and superior data display while still being simple and intuitive to use. From the extra heavy gauge steel welded frame to the adjustable crank arms, the First Degree E-920 Upper Body Ergometer is built to last. Other features include a contoured comfort seat with side grips and lumbar support, adjustable main arm from horizontal to vertical with an internal gas assist mechanism and 20 levels of resistance that adjusts by a touch of a lever. To top it all off, it comes with a great manufacturer warranty! The First Degree E720 Fluid Cycle XT uses water as it’s form of resistance. This is the most accurate manner in which to simulate actual outdoor rowing and provides a smooth and consistent sensation throughout the range of motion of the exercise. The natural, soothing sound is an added benefit of the water and contributes to a relaxing and comforting workout experience. Water has unique “cube rule” physical properties, which mean that to go twice as fast through it requires 8 times the effort! So as the athlete increases workout intensity, the Fluid Technology resistance unit responds instantly. There’s absolutely no slack, no slippage and no flat spots! Its full on resistance and always there for you at the precise moment you want it! Rotating paddles act on water in the outer chamber to provide the necessary resistance to the athlete’s effort, and dissipate energy. Metal Frame: 10 Year Warranty – First Degree Fitness will repair or replace the metal Main Frame of the Rower should it fail due to any defect in materials or workmanship within 10 years of the original purchase. Warranty does not apply to frame coating. Polycarbonate Tank & Seals: 3 Year Limited Warranty – First Degree Fitness will repair or replace the polycarbonate tank or seals should they fail due to any defect in materials or workmanship within 3 years of the original purchase. Mechanical Components (of a non-wearing nature): 1 Year Limited Warranty – First Degree Fitness will repair or replace any mechanical component should it fail due to any defect in materials or workmanship within 1 year of the original purchase. All Other Components (of a wearing nature): 1 Year Limited Warranty – First Degree Fitness will repair or replace any component should it fail due to any defect in materials or workmanship within 1 year of the original purchase.